Great for adoptions, personal fundraisers, missionaries, youth groups, and whatever else you might be fundraising for! My name is Kristin! 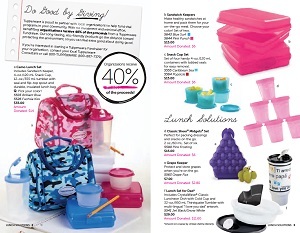 I would love to kick start your fundraiser by offering you 40% of tupperware sales. Give me a call today and I can send you your free tupperware catalogs so you can start selling tupperware and start reaching your fundraising goal! Start your fundraiser with me today by calling me at 407-718-9133! You keep 40% of your tupperware sales! Once you have a big order of tupperware from your supporters, order their tupperware and pay 60% of your sales. You keep the rest! Q: How do I get my tupperware catalog to show people what they can buy? Does it cost anything? A: You can contact Kristin to get your catalogs. No, there is no cost for these. Q: How do I get the tupperware to the people that ordered it? Do I have to pay shipping? A: Kristin will send all of your tupperware to your house, church, or non-profit's address. No, you will not be charged for shipping. Q: Do I have to pay anything to start? A: No, you do not pay anything upfront. You only owe 60% of your tupperware sales to purchase the tupperware for people that have already ordered and you keep the other 40%! Q: Is there a minimum that I have to sell?